James Ellroy was born in Los Angeles in 1948. He grew up in the epicentre of American noir at the height of the classic film noir period: ‘I remember feeling that things were going on outside the frame of what I was seeing. The language I got partly from my father, who swore a lot. It was an older L.A., a man’s L.A., where everybody smoked cigarettes and ate steak and went to fights’ (Kihn 1992: 32). This experiential, inchoate knowledge of Los Angeles was to prove Ellroy’s most valuable education. He absorbed what he saw at home and on the streets, and culturally he gravitated towards this world more than any other: ‘My passion for movies does not extend beyond their depiction of crime. My filmic pantheon rarely goes past 1959 and the end of the film noir age’ (Ellroy 1997a: xvii). The city and the era had an enormous influence on his formative years and on his identity as a crime writer. One of Ellroy’s main aims as a crime novelist has been to revisit and reimagine this noir era in the LA Quartet series. Noir presents a world where politics is a byword for corruption, individuals are morally compromised, and protagonists are resigned to their fate knowing there will be no happy endings. It is noir’s darkness which makes it so attractive, and Ellroy’s historical fiction has captured the essence of this noir paradox. Yet even though his writing style is nostalgically drawn to film noir and detective fiction in the era of the 1940s and 1950s, Ellroy’s noir vision deconstructs both the perceived glamour and social conservatism of the era: his LA is a city riven with organized crime and LAPD corruption. The history of Los Angeles and its cinematic identity was just one inspiration for Ellroy. He would also draw on biographical elements of his own life in his fiction, including, most notably, the unsolved murder of his mother Geneva Hilliker Ellroy in 1958. Ellroy would entwine LA narratives with that of his mother’s death to deepen, contextualize, spiritualize and fictionalize his mother’s influence on his life. Ellroy’s childhood discovery of the Black Dahlia case, the most famous unsolved murder in LA history, while reading Jack Webb’s The Badge (1958), was also significant. Before he reached adolescence, Ellroy had discovered the two main obsessions of his literary career: his mother’s murder and the Black Dahlia herself – Elizabeth Short. Ellroy’s path to becoming a writer, however, was to be an unconventional one. With his father’s death in 1965, Ellroy lost all restraining influences. The next few years of his life were characterized by drug and alcohol abuse, homelessness, petty crime and several stints in the LA County Jail. It was a brush with death that finally persuaded Ellroy to reform and start writing. In 1975, Ellroy suffered a mental and physical breakdown, which he has described as ‘post-alcoholic brain syndrome’, but he did not stop substance abusing until he nearly died of pneumonia and a lung abscess (Kihn 1992: 25). In 1977, he joined Alcoholics Anonymous which became a turning point: employment followed sobriety. His first novel, Brown’s Requiem, was published in 1981. Ellroy slowly and steadily built his reputation as a crime writer. His breakthrough came with his seventh novel, The Black Dahlia (1987), in which he created a fictional solution to the murder of Elizabeth Short and allusively explored his obsession with his mother’s murder. Since then, Ellroy has become one of the most prominent of contemporary crime writers through the publication of a series of novels merging noir with historical revisionism in the LA Quartet and Underworld USA trilogy. In parallel to his work as a novelist, Ellroy has developed a public persona as the self-styled Demon Dog of American Crime Fiction. Through interviews, Ellroy found an outlet for his literary persona, elevating standard publicity opportunities into a form of creative performance, building and deconstructing narratives which in turn play with the semi-biographical as well as the purely fictional narratives of the novels: ‘As critical acclaim and response has built up, every interview I give is a chance to puncture the myth I’ve created about my work and refine it’ (Hogan 1995: 60). The documentaries James Ellroy: American Dog (2006) and Feast of Death (2001) feature scenes with Ellroy at his favourite LA restaurant, the Pacific Dining Car, holding court with his contacts in the LAPD alongside fellow writers such as Bruce Wagner and Larry Harnisch and show-business friends Dana Delany and Nick Nolte, discussing unsolved cases and LA history. Few crime writers could match Ellroy in terms of clout and his ability to generate publicity, but by his own admission much of what he says should be taken with a degree of scepticism. 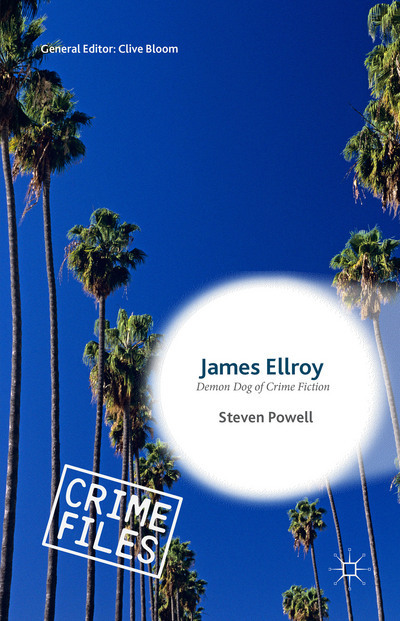 Ellroy is an author at ease with his own sense of celebrity, but, in one of the many contradictory sides of his character, he relishes his self-crafted image as an outsider – too edgy, unpredictable and maverick to ever truly belong to the Hollywood or publishing establishment. He can be an intimidating figure to some journalists, as Iain Johnston wrote during one interview: ‘The myopic stare of James Ellroy, too, reveals much about his character – his suppressed anxiety, resolute obsession, locked down concentration, fierce determination and wild, black humour, are all detectable there’ (Johnston 2014). In his public appearances, Ellroy cuts a striking figure, often dressed in garish Hawaiian shirts, spouting outrageous right-wing views and barking like a dog. This manic behaviour might seem to contradict his reputation as an acclaimed historical novelist, but in part Ellroy maintains his creativity and uniqueness by eschewing respectability. You can find more information on the book on Palgrave’s website. Congratulations, very much looking forward to reading this! Thanks Alex. I’m looking forward to hearing what my fellow Ellrovians have to say about it.